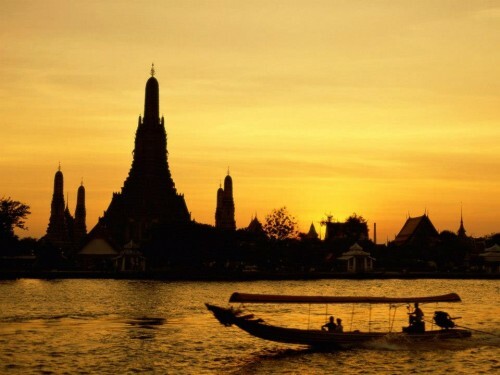 Cheap flights to Thailand: Bangkok for €374! UPDATE 15.10.: flights to Thailand on route Amsterdam-Bangkok-Frankfurt (also to Berlin, Munich, etc) are again available for only €381 with Etihad! Example dates: 2.-17.2., 4.-17.2., 3.-24.2., 4.3.-18.3. Book here, check screenshot. 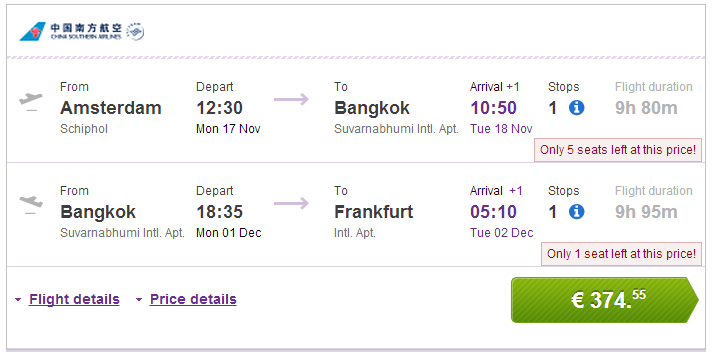 UPDATE 16.9.: flights to Bangkok on the same route now available for only €374! Example dates: 17.11.-1.12., 24.11.-8.12., 29.1.-6.2., 25.2.-11.3. Check screenshot. China Southern Airlines now offer cheap flights to Thailand in the main season! 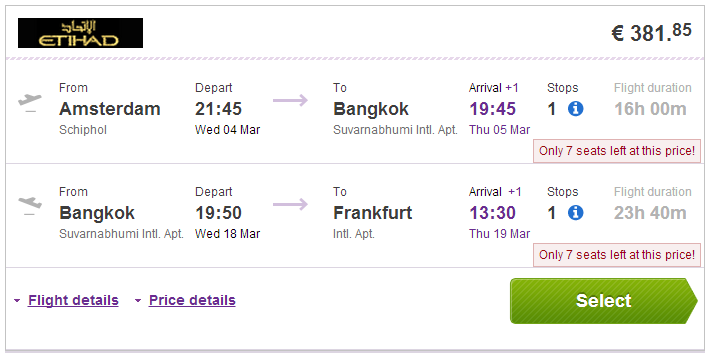 Multicity flights Amsterdam – Bangkok – Frankfurt are now available for only €415. There is one short stopover in Abu Dhabi, 23 kg luggage is included. Travel dates are from November 2014 to March 2015 which is main tourist season in Thailand. Book via BudgetAir (click on Show extra search options to enter return to Frankfurt). « Cheap flights to/from Poland with LOT: Warsaw from Prague and other cities for €83!